However, there are three critical differences that make both types of marketplaces live on the opposite poles. While marketplace websites sell physical and digital products, the latter involves services. While the former delivers the product physically and digitally, the latter requires service fulfillment. While the former demands a purchase, the latter involves on-demand service request. A service marketplace is an eCommerce website that connects a service provider with a service seeker. You can call them service aggregators, which allow the users to find different vendors for a specific job/task on-demand. Preference based service marketplace- which allows a user to allot a task to a vendor of choice from a list. Best example: Task Rabbit. It lets the customers select the vendor who will do the assigned job. Bidding based- which allows a user to post a task publically and let vendors bid their prices to get selected for the task. Best example: Thumbtack. It selects the vendor automatically based on the match for the bidden price. Depending on the services to be offered and the business model, we can decide any suitable model for the service marketplace. For example, Freelancer has a great name in software development tasks, Uber is popular in Taxi and Food ordering services, Thumbtack is a well-known destination for find skilled labor and other professionals, and Varsity is great for on-demand private tuitions. 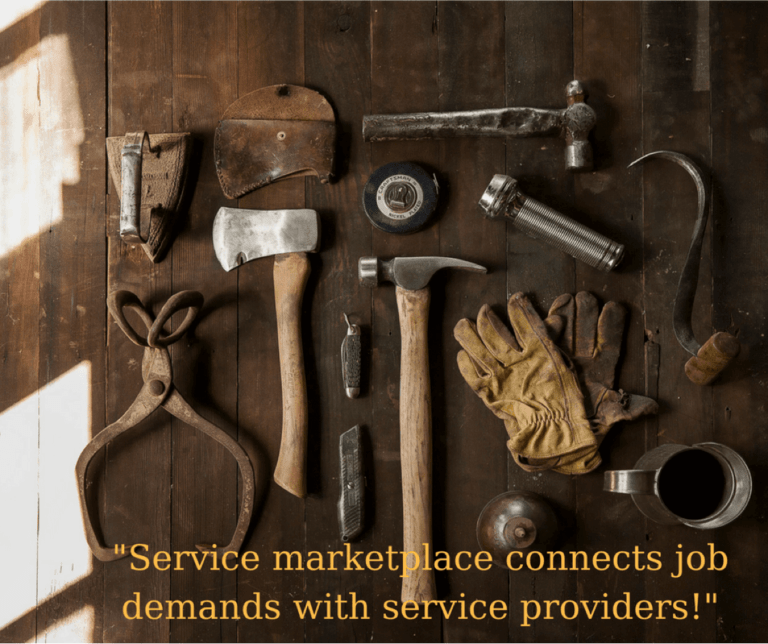 Is Service marketplace a wise business idea? The above section clearly defines how different names have gained immense popularities in their specific niches. Bottom line is, the service industry is a much boarder niche and allows unlimited ways to offer and fulfil a service. The diversity of services and the innovative ways of fulfillments make every service marketplace business idea different from the existing one. Moreover, a service marketplace is not just a medium of fulfilment for the users, but also offers employment to thousands of skilled individuals and businesses who can take part in your venture to make it successful. Even the stats agree that over 43% of the workforce by 2020 in the US will be freelancers or self-employed. So, yes, starting service marketplace is a profitable and completely sane idea in 2019. How to Create a Service Marketplace without coding? There are varied ways of creating a service marketplace and the approach involving the coding-less m is one of them. First, let’s see the other methods, and then we can compare our own coding-less approach with them. Approach 1: Code your-self from the scratch. Approach 2: Hire a team of experts and let them code it from the scratch. Approach 3: Purchase a service marketplace script and customize it by yourself. Approach 4: Purchase a service marketplace script and ask the same vendors to customize it. If you have the coding skills and want to launch the website as quickly as possible, the third approach is economical for you. Additionally, if you also have enough time and enough coding skills, the first option will save you a great deal of money. Or you can add up the hiring cost with enough time to let experts code your website from the scratch. The cost of the same would range somewhere between $5.000 and $50.000. However, if you do not possess the development skills and have a budget less than $5.000 USD, the fourth approach will not just do it quickly, but would also save some great money. Mobile Responsive UI– Accessibility to browse the website from mobile devices without breaking the layout. Geo-location based listing– Ability for users to find a service provider within the accessible geographical limits only. Google Maps integration–Google Maps integration to let users track the precise location of the service providers. Maybe for a similar real-time location tracking as in Uber eats. Payment processors–Integrated payment gateways and processors to facilitate online transactions on the sites. Example, PayPal integration to receive credit cards, debit cards and wallet-based payments. Google Analytics integration–to track SEO and related metrics. Dispute management system–A system capable of handling disputes through ticket system. Disputes can be from user-service provider, user-admin, and service provider-admin. FAQ manager–A dedicated section with all the information and questions answered regarding the operation of the service marketplace. FAQ can be both for Service vendors and Users. Example, site policies, guide for vendor sign-ups, refund policies, Terms and conditions, fair use policies, Do’s and Don’ts, best practices, etc. Email messaging system–Email integration for not just customer support but also for launching email marketing campaigns. E-mail templates–Inbuilt and customizable email templates to send triggered emails to different users or service providers in various events. Example, welcome email on vendor sign up, conformation email on service fulfilment etc. Social sharing–Integration with social media platforms for social sharing as well as for social media login. This feature lets you drive some high-quality traffic from your fellowship on the social media sites. Multi-Currency and multi-lingual support–Gives the ability to launch the service in different geo-locations of the world. Service request- UI for the users to submit a task by providing different details like type, time, location etc. Service acceptance/decline- Ability for the vendors to accept or decline a service request. Ratings and review management- Features for the users to rate and write reviews for the service providers after fulfilment. Vendor selection algorithm- If using the bidding option, then it requires an algorithm that automatically sends the service request to the closest bidder. If using manual selection, then an algorithm is required to filter out the list of most suitable and relevant vendors based on a service request. Live chat system- Live chat system to let users talk and negotiate with the service vendor. Moreover, a dedicated live chat system for vendors to talk with the marketplace Admin. Dedicate dashboards– Dedicated front end dashboards for the users as well as vendors with corresponding features and access to the analytics like order history, earnings made, commissions, etc. Commission management system– Admin UI to set global or local commission rates on different tasks, categories, locations, or vendors. The same UI also allow admin to view detailed report of the commissions earned from different sellers. Robust search– An advanced algorithm and UI to let users search on the marketplace based differing aspect like on keywords, price, category, and rating. Step 1: The users places a search on the websites. Based on the search algorithm, the user sees a search results from different categories of available services. Step 2: The users select the service and answer a questionnaire to describe the requirement. Step 3: Based on the requirements, the matching algorithm sends the request to the most suitable vendor. If the vendor accepts the request, it fixes the appointment for the mentioned location and time frame. Step 4: The vendor arrives at the user’s location and finishes the job. In the meantime, the user can also track the live location of the vendor arriving at the user’s location. Step 5: Upon completion, the user pays the vendor on the site using any listed payment option. Step 6: The user can write a review or submit a rating for the vendor based on the satisfaction. The rating also affects the vendor’s visibility in the next matching for a similar job. Hope this post could clarify most of the apprehensions about starting a service marketplace without coding. Drop your comments to clarify your doubts on the same. Optimistically, my experience with service marketplace development would be competent enough to guide you on most of the aspects. This entry was posted in Technology Advice on February 19, 2019 by Michael Pignataro.